PALO ALTO, CA – Hidden in the pages of “Big Fish,” the mythic novel written in l998 by DANIEL WALLACE, are many metaphorical connotations, and each one of them teach us a lesson. Yet, when these connotations are expressed in songs, interjected with dialogue and dances in its musical adaptation by the same name, they become harder to identify. 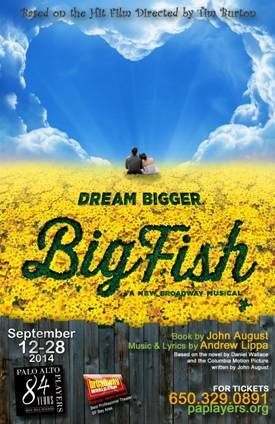 So, one week after the West Coast Premiere of BIG FISH the musical, that opened the 84th Season of PALO ALTO PLAYERS, in Palo Alto, we went to see the work, and search for them. BIG FISH the musical, with book written by JOHN AUGUST and music and lyrics by ANDRE LIPPA like the novel, relates the story of Edward Bloom, (CHRIS JANSSEN) a traveling Salesman from Alabama, who is trying, to relate with his only son Will (NIC ROY GARCIA as a child and DANNYMARTIN as an adult) by telling him fantastical stories of imaginary creatures: A girl in the water, a Witch, the Ringmaster of a Circus’, and a Giant that he met during his travels. What bothers his son about his father's "big tales" is that, for one reason of another, at the end of each story, Edward makes himself "the hero," in all of them. The "tall tales" in BIG FISH are deceiving. Because since they are "tales" and their “characters” appeal to children, erroneously, we may conclude that BIG FISH is a fairytale and that one needs to be "young at heart" in order to enjoy it. However, If we analize the “characters” in each one of the "tall tales" we start to understand that each one of them represents a metaphor, and to discover their meaning, requires thought. PAP Director, PATRICK KLEIN who selected "BIG FISH the musical," as the work to open their Season, designed its scenes, and directed it, fully understood the "core" in this work. Because of it, in PAP's production, one can see that each one of the actors under his direction, was able to convey the correct feeling to make the story told in BIG FISH, meaningful to all of us. 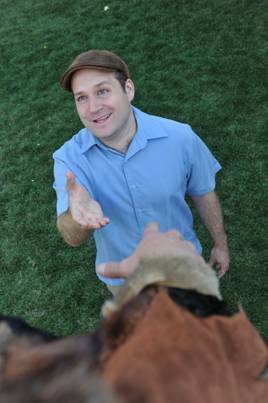 JANSSEN, who represented Bloom, played his character as a simple yet likable man. A married traveling salesman with a wife he adores and a son at home, who because of his job, he is "forced" to abandon constantly. So, because of its traveling, while his relation with his wife is perfect, he is aware that his father-son relationship is disintegrating little by little. While Will was a boy, (GARCIA) he was never interested in his father’s “stories”. What he wanted, was for Edward, to read him History Books, and the boy felt embarrassed, each time his father made himself the "hero" in each story. In the musical, Will (MARTIN) now a man about to get married, expresses his frustration of not ever getting to know his father in “Stranger a beautiful song. Obviously Will, never understood, that “The Big Fish” in a small pond, his father talked about was himsef, expressing how he felt, living in Alabama. And in "character", Edward, the man, was a giant. A determined young man, who knew what he wanted. A fearful boy unafraid of the witch. A man capable to love with such a passion, that accepted to work free, for tree years, to learn a “bit” of information about Sandra, every month. 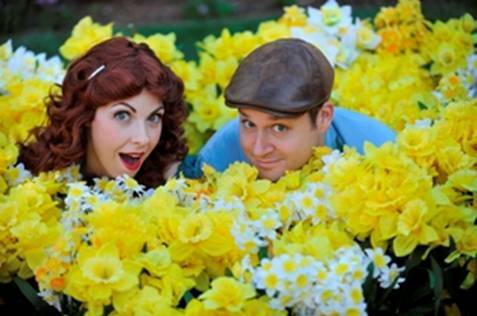 A romantic, whose world stopped when he met his future wife, and filled a field with Daffodils, her favorite flowers. and later on, after he married her, a faithful husband. And Edward was also a real heroe who took the most dangerous missions in the Army to have his duty cut short. He may had never saved General Patton from a poisoned dart, but he saved Ashton by purchasing the town. So unknown to Will, this “stranger” he never knew, was constantly telling him who he was in every one of his actions in his fantastic stories and encouraging him, to "be a heroe," in other words, to follow his example. Sadly, Will never understood that. As a singer, JANSEEN’s voice is pleasant but not powerful, but on that night, (9/20) he managed to put lots of feeling in every one of his songs and his acting was superb. It reflected every one of his different emotions. As Sandra, his wife, ELISABETH SANTANA, acted her role as a loving wife, realistically SANTANA has a well educated singing voice, with a mellow timbre and on that night she used it well. Will Bloom as a little boy (NIC ROY GARCIA) was great, and he knew how to portray, with realism a kid who is bored about his father’s tales. He had a charming duet with his dad. As Will Bloom the adult (MARTIN) played his role with veracity and gave us a felt rendition of “Stranger” but on that night, he could have needed to put more emotion in his dramatic role. As Jenny Hill, JESSICA WHITTERMORE was convincing. Don Price (ISMAL) acted his role with realism. The Ensemble was great, in both their dancing and their chorus. KLEIN’s sets were capable to transport the audience to the different localities. The river, in front of the stage was a “touch of Genius,” and the projections (NICK KUMAMOTO) complimented the action well. The costume crew created marvelous costumes. Without being catchy, the music in BIG FISH is tuneful and in spite the violin in the orchestra which needed tuning, the overall performance went well. On that night, it got a standing ovation.